This map shows a small Area of Chongwen District in its North-Eastern most Corner in the immediate area of Tiananmen Square and the Qianmen ( Front Gate ) at its South Side. The north border is formed roughly by (Dong) ChangÁn Jie in the North ( Forbidden City , Oriental Plaza ) , the South Border of the map is made up by Dashilan Street in the South-West and The New World Building at Chongwenmennei Dajie in the South-East. 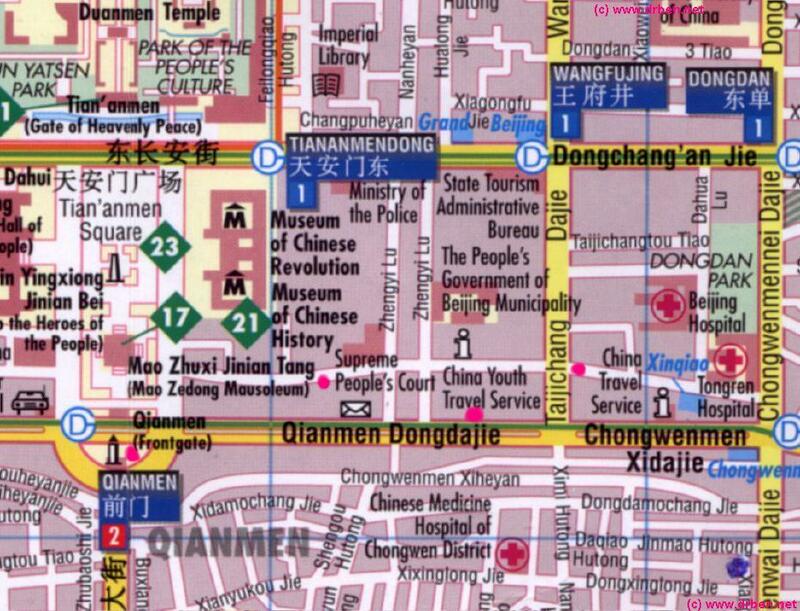 All streets of any size are included, as well as a number of main monuments, hotels and official bureaus and agencies. Compare Maps of the Chongwen-QianMen Area and Follow Links to more Information and Photos !